Stephen DOW II – bcd – (1670 – 1743) was Alex’s 7th Great Grandfather; one of 256 in this generation of the Miller line. Stephen Dow was born 10 Sep 1670 in Haverhill, Essex Co, Mass. His parents were Stephen DOW I and Ann STACY. He was with his father in the Haverhill garrison 15 Mar 1697 when two of his sisters and twenty-five others were slain by Indians. He married Mary HUTCHINS on 14 Dec 1697 in Haverhill, Essex Co., Mass. Mary became his step-sister many years later in 1715 when his father married Mary’s mother. Stephen died 17 Jun 1743. in Haverhill, Essex Co. Mass. Mary Hutchins was born 09 Mar 1679 in Haverhill, Essex Co. Mass. Her parents were Joseph HUTCHINS and Joanna CORLISS. Mary died 29 Oct 1734 in Haverhill, Mass. After the deaths of Stephen’s mother and Mary’s father, her mother Johannah (Corliss) Hutchins married 17 Feb 1717 [the elder] Stephen Dow. 10 Apr 1744 in Salem NH 1794 in Oromoeto, New Brunswick, Canada. Stephen was a carpenter and lifelong resident of Haverhill. He was 27 when the Dustin Massacre occurred and he was with his father in garrison. The Indians had a peculiar call, known to the colonists as “their whistle”; it was made by placing both hands over ther mouth. Stephen was the only man in Haverhill who learned to imitate it. He used it to set up ambuscades, but whether successfully or not does not appear in history. He took part in a number of Indian fights, some away from Haverhill. Stephen was in the Duston Garrison House with his father during the 15 Mar 1696/97 Indians attack. His sisters, Martha and Hannah, and six other close relatives were killed. Built by Thomas Duston by order of the court. Operated as a museum in the summer months today. The exact site of Stephen’s house has not been determined, but it must have been near, perhaps part of, his father’s homestead as 5 Dec 1723, he filed a petition for five additional acres “beyond Nicholas White’s” This in 1720 was the extreme northeast edge of the settlement, land afterwards included in Salem, NH. The area was first settled in 1652. As early as 1736, Salem was the “North Parish” of Methuen, Massachusetts, or “Methuen District.” In 1741, when the boundary line between Massachusetts and New Hampshire was re-established, the “North Parish” became part of New Hampshire, and was given the name “Salem,” taken from nearby Salem, Massachusetts. He was at Crown Point in 1762 and won a Lieutenant’s commission from the King. Fort Crown Point, was a British fort built by the combined efforts of both British and Provincial troops (from New York and the New England Colonies) in North America in 1759 at narrows on Lake Champlain on the border between modern New York State and Vermont. Erected to secure the region against the French, the Fort is located near the town of Crown Point, New York and was the largest earthen fortress built in the United States. 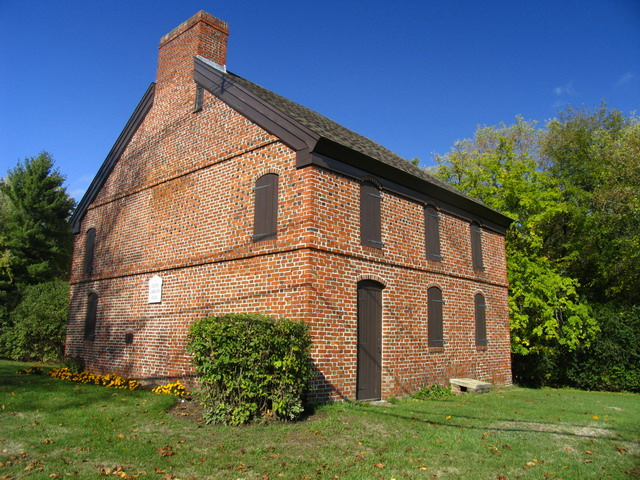 The site is now administered as Crown Point State Historic Site. Nathaniel and his family anticipated the Revolution long before it came and were prepared for it. Nathaniel used his own funds to prepare the troops and in 1775 was serving as a volunteer under Capt. Henry Elikins in the hurried plans for the defense of Piscataway. His commission as Lieut. from the Continental Congress soon arrived, and he was later commissioned as Captian. All three commissions are preserved as family heirlooms. The Battle of Bennington took place on August 16, 1777, in Walloomsac, New York, about 10 miles from its namesake Bennington, Vermont. A rebel force of 2,000 men, primarily composed of New Hampshire and Massachusetts militiamen, led by General John Stark, and reinforced by men led by Colonel Seth Warner and members of the Green Mountain Boys, decisively defeated a detachment of General John Burgoyne’s army led by Lieutenant Colonel Friedrich Baum, and supported by additional men under Lieutenant Colonel Heinrich von Breymann. Baum’s detachment was a mixed force of 700 composed of dismounted Brunswick dragoons, Canadians, Loyalists, and Indians. He was sent by Burgoyne to raid Bennington in the disputed New Hampshire Grants area for horses, draft animals, and other supplies. Believing the town to be only lightly defended, Burgoyne and Baum were unaware that Stark and 1,500 militiamen were stationed there. With the enemy force positioned on and around a large hill, General Stark decided to use his 2,000 militiamen to surround them. “Yonder are the Redcoats,” Stark is supposed to have said. “We will defeat them or Molly Stark will sleep a widow tonight.”..Small bands of militiamen, pretending to be loyal Tories, worked their way behind enemy positions. When firing began, these men turned on the Hessians and Tories around them. Those not killed fled into the woods, pursued by the militiamen. Other Americans surged up the hill to the Hessian breastworks, and for two hours the battle raged. The Hessian commander was mortally wounded when, ammunition exhausted, he and his Dragoons attempted to hack their way off the hill with their swords…When the battle was at its height, reinforcements arrived from Burgoyne. Luckily, the Vermont militia came up at about the same time to reinforce Stark, and again the fighting raged. American victory was assured when the militiamen drove off the Hessian reinforcements. The battle was an important victory for the rebel cause, as it reduced Burgoyne’s army in size by almost 1,000 men, led his Indian support to largely abandon him, and deprived him of needed supplies, all factors that contributed to Burgoyne’s eventual surrender at Saratoga. The victory also galvanized colonial support for the independence movement, and played a role in bringing France into the war on the rebel side. The battle anniversary is celebrated in the state of Vermont as Bennington Battle Day. Unknown to Burgoyne, the citizens of the New Hampshire Grants territory (which was then disputed between New York and the Vermont Republic) had appealed to the states of New Hampshire and Massachusetts for protection from the invading army following the British capture of Ticonderoga. New Hampshire responded on July 18 by authorizing John Stark to raise a militia for the defense of the people “or the annoyance of the enemy”. Using funds provided by John Langdon, Stark raised 1,500 New Hampshire militiamen in the space of six days, more than ten percent of New Hampshire’s male population over the age of sixteen. They were first marched to the Fort at Number 4 (modern Charlestown, New Hampshire), then crossed the river border into the Grants and stopped at Manchester, where Stark conferred with Warner. While in Manchester, General Benjamin Lincoln, whose promotion in preference to Stark had been the cause for Stark’s resignation from the Continental Army, attempted to assert Army authority over Stark and his men. Stark refused, stating that he was solely responsible to the New Hampshire authorities. Stark then went on to Bennington with Warner as a guide, while Warner’s men remained in Manchester. Lincoln returned to the American camp at Stillwater, where he and General Philip Schuyler hatched a plan for Lincoln, with 500 men, to join with Stark and Warner in actions to harass Burgoyne’s communications and supply lines at Skenesboro. Baum’s movements significantly altered these plans. Nathaniel was present at the surrender of General Burgoyne. During the Saratoga campaign he surrendered his army of 5,000 men to the American troops on October 17, 1777. Appointed to command a force designated to capture Albany and end the rebellion, Burgoyne advanced from Canada but soon found himself surrounded and outnumbered. He fought two battles at Saratoga, but was forced to open negotiations with Horatio Gates. Although he agreed to a convention, on 17 October 1777, which would allow his troops to return home, this was subsequently revoked and his men were made prisoners. Burgoyne faced criticism when he returned to Britain, and never held another active command. Apparently, Nathaniel sold what land grant he received under the act of 1783, for no descendant appears as having such land. He died in 1787.
i. Daniel Nathaniel Dow – bcdba – b. 28 Jun 1728 Haverhill; d. Feb 1758; m, 16 Nov 1748 to Rebeckah Peaslee (bapt 19 Nov 1727 Haverhill – 2 Jun 1757 Salem, NH) Her parents were Daniel Peaslee and Rebecca Kelly. Both Daniel and Rebecca died young and presumably their four orphan children (children 1750-54: Phineas, Olif, Zillah(Lydia? ), Percy) grew up with their grandfather Stephen DOW. At all events both boys learned the cooper’s trade. v. Jeremiah Dow – bcdbe – b. 14 Mar 1737/38 Haverhill, Mass. ; d. 10 Sep 1826 in Salem, Rockingham, New Hampshire; m. 1 May 1766 Bradford, Mass. to Lydia Kimball,(b. 8 Mar 1749 Bradford, Mass – d. 12 Mar 1826 Salem, Rockingham, NH). Lydia’s parents were Isaac Kimball and Elizabeth Jewett. She was a descendant of Richard Kimball, the pioneer. Jeremiah and Lydia had seven children. Jeremiah lived at what is now Salem, New Hampshire. He was first in the Provincial service at Crown Point in 1762 in the French and Indian war; An early paper shows that he was in the Provencial Service at Crown Point and sick at No. 4 for 33 days and not able to go from Crown Point to No. 4 on foot. (Charlestown, NH was called No. 4 before 1753 and the name was sometimes used until long after that date) Afterward he was in Captain Dearborn’s company, Colonel Stark’s regiment, and in Captain Henry Elkin’s company, enlisted for the defense of Piscataqua harbor in the revolution,November, 1775. He was captain of a company in 1776, and in Lieutenant-Colonel Welsh’s regiment at the battle of Bennington and at the surrender of General Burgoyne. The family possesses papers relating to Captain Dow, dated 1758, a lieutenant’s commission under George III, and a captain’s commission granted for some act of bravery by the Continental Congress during the revolution were preserved, together with a stirring letter from his commanding officer in the revolution urging him to enlist more men, but were lost or stolen from the Polytechnic Institute of Louisville, Kentucky, where they were deposited by one of the Dow family for safe-keeping while he was living at Louisville. She married third to Obadiah Belknap whose first wife Sarah Mitchel died 27 Oct 1742. Children of Mary and David All born and married in Haverhill. ii. Sarah Roberts – bcdcb – b. 19 Apr 1722 Haverhill; d. 12 Dec 1812 Londonderry ; m. 1 Sep 1741 to James Graves (22 Apr 1714 Londonderry or Chelmsford – 7 May 1765 Southampton) His parents were Samuel Graves and Sarah Perkins. He was great grandson of Abraham Perkins father of Hampton. He bought in 1761 a large farm in South Hampton and was an inn keeper. Children of Mary and Nathaniel All born and married in Haverhill. iii. Rachel Marble – bcdcc – b. 13 Jul 1727; d. 1785 in Mass; m. 3 Oct 1751 James Davis (b. 1726 in Methuen, Essex, Mass. – d. 27 Aug 1778 in Mass.) James’ parents were James Davis (1695 – 174o) and Sarah Bayley (1694 – 1741). Rachel and James had five children born between 1753 and 1777.
ii. Mary Heath – bcddb – b. 10 Sep 1729 Haverhill, Mass. ; d. 5 Jun 1795 – Chester, Windsor, Vermont; m. 1748 to Moses Gile (b. 15 Feb 1720 in Haverhill – d. 1786 in Chester Windsor VT) Moses’ parents were Joseph Gile (1691 – ) and Mary Heath (1700 –). Mary and Moses had eight children born between 1756 and 1769.
v. Deliverance Heath bapt. 25 Sep 1737 Haverhill, Essex, Mass. vi. Green Heath bapt. 25 Sep 1737 Haverhill, Essex, Mass. viii. William Heath bapt. 30 Aug 1741 Haverhill, Essex, Mass. Green, Hannah, Deliverance,, children of William Heath, baptized 1737 may or may not belong here. Richard was of Salem, NH, his home close to that of his brother Nathaniel, a locality first chosen by his grandfather Stephen. Richard and his grandsons were in the military. Richard was 1st in service in the Indian campaign of 1746 under Capt. John Goffe at Dover; 1758 enlisted as private, Capt. John Hazzens, against Ticonderoga and distinguished himself at Crown Point. He gained a Lieut’s commission from the Crown. 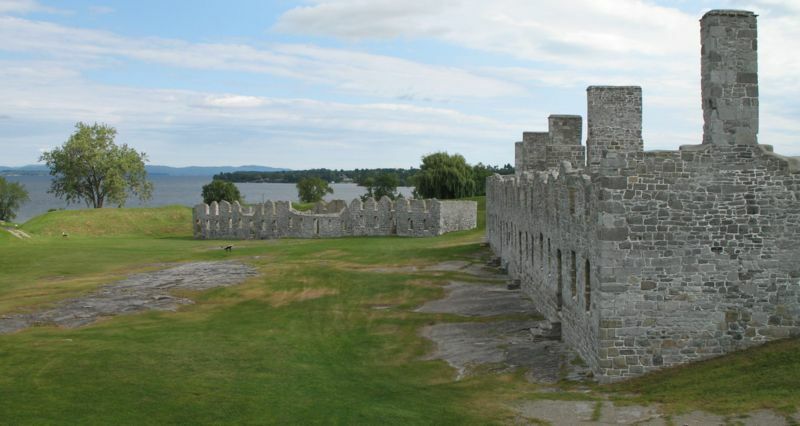 Crown Point, was a British fort built by the combined efforts of both British and Provincial troops (from New York and the New England Colonies) in North America in 1759 at narrows on Lake Champlain on the border between modern New York State and Vermont. Erected to secure the region against the French, the Fort is located near the town of Crown Point, New York and was the largest earthen fortress built in the United States. Richard was one of the many who expected the Revolution and prepared for it financially and otherwise. Three of his sons were at Lexington. He himself took Captaincy, serving and instructing recruits at Great Island from Nov 5, 1775. In this company were ensign Jeremiah Dow, his own son Asa as Sgt, Percy Dow (bcdbad) , fifer, and Isaac Dow private. The identity of Isaac is uncertain. Although 70 yrs of age Richard advanced all his money to the town to pay soldier bounties and equip troops, and was appointed to raise a new company for service in N.Y. State. His oldest son had been crippled at Bunker Hill, his second already held a Lieutenancy. 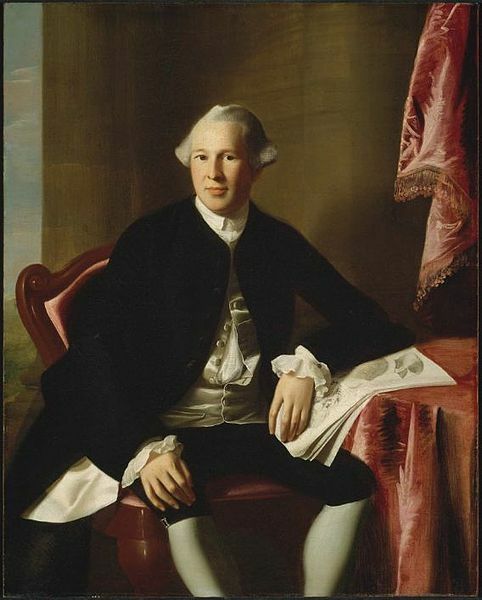 His third son, Richard was elected captain of the new company and his commission confirmed by the Continental Congress. The 4th son served through the war as agent. This company was assigned to the regiment of Col. Nathan Hale of Coventry, Conn. Richard himself retired to his Salem home; where he died. i. Capt. Reuben Dow – bcdea – b. 7 Sep 1729; bapt. 25 Oct 1730; d. 9 Feb 1811 in Hollis, Hillsborough, New Hampshire; m. 8 Feb 1749 Salem, Rockingham, New Hampshire to Alidia, Ledea, Leadeah, or Eleda Jones (22 Apr 1733 Methuen, Essex, Mass – 17 Jul 1825 Hollis, Hillsborough, NH) Her parents were James Jr. Jones and Tirzah Titcomb. Alternatively, her parents were Evan Jones (1691 – 1764) and Lydia Ordaway (1693 – ). The Jones family descends from Evan Jones, immigrant from London, age 19 on 21 May 1631 of Amesbury and Salisbury. Reuben and Alidia had six children born between 1754 and 1773. Rueben was a First Lieutenant in the Hollis, NH Militia before 07 November 1774. Acting Captain at Lexington, and commissioned permanently as Captain a monthlater. Wounded (right ankle) in the Battle of Bunker Hill. His company arrived at Bunker Hill on 16 June 1775 and dug 16 trenches. In 1783, permanently granted a disability pension for the remainder of his life. Capt. Reuben Dow”s company dug 16 trenches at Bunker Hill before he was shot in the ankle. Reuben and Alidia moved in 1761 twenty miles west from Salem, Rockingham, NH to Hollis, Hillsborough, NH, two years later buying the homestead still owned  by his posterity. This home beautifully located in as beautiful a village as there is in New Hampshire now contains all his Revolutionary relics. He entered at once the local militia and was its 1st Lieut. when Lexington was fought. The captain was temporarily incapacitated so Reuben marched to Lexington as acting Captain. 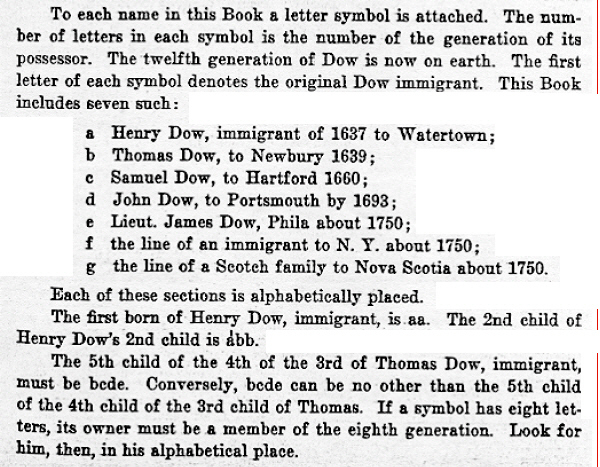 Dow’s Co. began as the Hollis, NH Militia Company. After receiving word of the Lexington Alarm on the afternoon of April 19, 1775 a total of 92 men marched to Cambridge before dawn the following day. Being a typical New England unit, they opted to elect new officers and NCO’s before they left. In this election, Reuben Dow was elected Captain, John Goss as 1st Lieut., and John Cummings as 2nd Lieut. Four Sergeants and four Corporals were also chosen. According to town legend, the march to Cambridge was not only long but hot, and they stopped to quench their thirst at a tavern in the Billerica area, where they may have stayed for a few days. The march to Lexington was made on foot and after a few days the Hollis company returned home to prepare further for the next fight and await the call. Thirty-Nine of the privates returned home in the next few weeks, however Fifty-Three of them volunteered in various units to serve for Eight months. Most of them re-enlisted in a new company under Captain Dow and the same Lieutenants. Shortly after the commencement of the Siege of Boston they were incorporated into Prescott’s Massachusetts Regiment as part of the Grand Massachusetts Army. . Prescott owned land in Hollis and knew most of the men very well, so it must have seemed a natural choice for them to fall under his command, rather than one of the unknown Colonels from New Hampshire. The call came quickly, so unexpectedly that Reuben’s little son Daniel was left to unyoke the oxen from the plough. Mrs. Dow made an equal division of the blankets in her store room and her mess pork,one half going to the soldiers. The company marched 69 strong all Hollis men, assigned to Col. Prescott’s regiment. It was the second to arrive on the field at Bunker Hill and spent the night of June 16 digging trenches. Next day, they were on the firing line The regiment served throughout the Siege of Boston and was present at the Battle of Bunker Hill. The company made up roughly one-sixth of the men under Col. Prescott on the 16th of June, 1775, who made their way to Breed’s Hill and began building the redoubt. The ensuing battle has, of course, gone down in history. Six men from the Company were killed in the battle, including the 1st Sgt, and eight men were wounded. The regiment, as a whole, recorded Forty-Two killed and Twenty-Eight wounded. By year’s end the enlistments of Captain Dow’s men ran out. Some returned home, many were signed on in other units, and some were discharged with pensions due to wounds. Captain Dow was in this last category. He returned to Hollis and served as Chairman of the Committee of Safety. Captain Reuben Dow, of Hollis, after the Battle of Lexington, raised a company of soldiers from Hollis and Pepperill, marked to Bunker Hill. Rueben was struck in the right ankle by a bullet which shattered the bone. Nevertheless, he made the retreat in good order with his troops. The bullet, which was extracted, is still preserved; but the effects of the wound are said to have eventually caused or hastened his demise. On account of his disability he was continued for a short time on half pay, later reduced to quarter. In 1783 he was cited to appear before the State authorities to show cause whey his pension should not be discontinued. A large number of witnesses were examined concerning Reuben’s ability to care for himself and the verdict confirmed his pension for life. He died 9 Feb 1811; he and his wife buried in Hollis churchyard. In 1927, the homestead with all its Revolutionary reliecs was owned by Charles Jeremiah Bell (bcdeabeaa). Reuben had three sons, Daniel, Stephen and Evan. Evan was a private under his father at Bunker Hill. 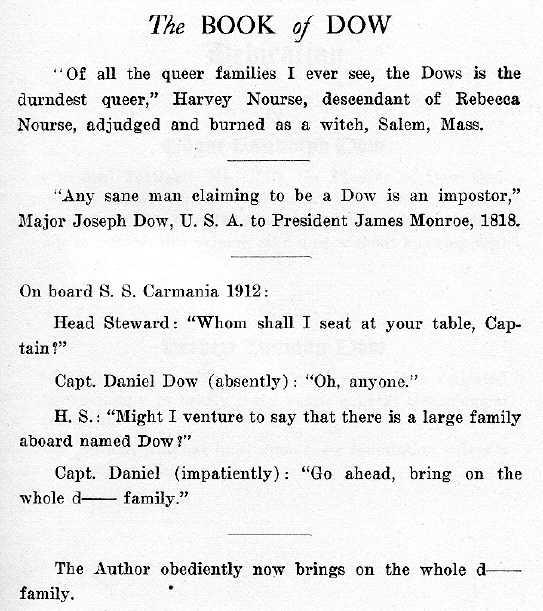 There are four instances of a Dow grandfather, father and son being in Revolutionary service at the same time. ii. Lt. Oliver Dow – bcdeb – b. 28 Jul 1736 Salem, Rockingham, NH; d. 18 Dec 1824, Waterville, Kennebec, Maine; m. 1757 to Hannah Pattee (7 Dec 1737 Haverhill – 11 Mar 1820) Her parents were Seth Pattee (1706 – 1776) and Dorcas Savory (1712 – 1784). Oliver and Hannah had nine children born between 1758 and 1779. 15 May – 18 Dec 1756 private in Capt. Samuel Watt company Col Nathaniel Meserve (Wiki) regiment. During the French and Indian War Colonel Meserve led the New Hampshire Provincial Regiment in 1756 to Fort Edward New York. 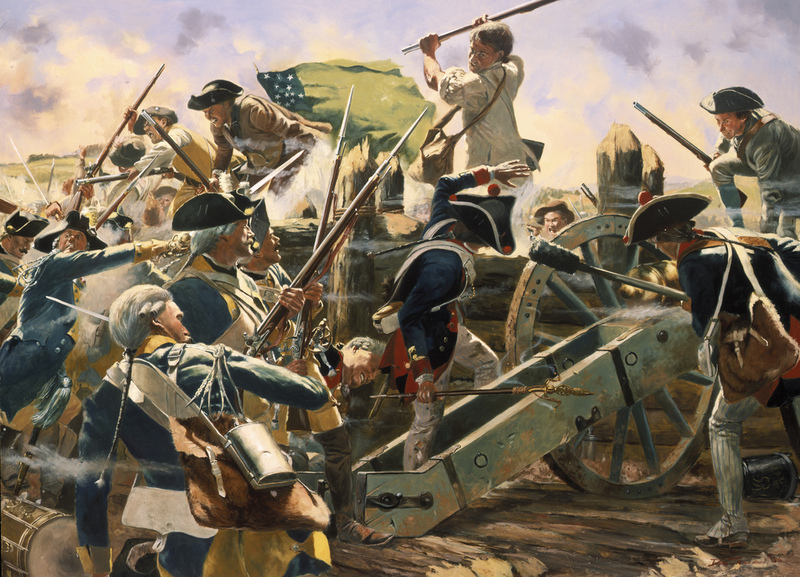 In the spring of 1756 two New Hampshire battalions were raised with Col. Nathaniel Meserve in command. The 1st battalion was sent to Nova Scotia and the 2nd to the newly built Fort William Henry. Oliver moved in 1773 40 miles north west from Salem to Hopkinton Merrimack, New Hampshire. That he was in Salem, NH early in 1775 was due either to a visit or in the expectation of hostilities. He was a Bunker Hill and 9 Jul 1776 was a 2nd Lieut, Lieut. Col. Thomas Stickney (wiki). It would be remarkable for a commissioned officer to re-enlist as a privte, but some Oliver Dow served 21 days in the RI campaign, Capt. Daniel Emerson, Col. Moses, Nichols, mustered out Aug 1778 and we know of no other Oliver. About 1790 the family moved back from Hopkinton to Salem, NH. Ill health pursued him, In 1804 the town voted to abate his taxes until his health was better. He finally retired to his son’s home in Waterville, Maine d. 18 Dec 1824.
iii. Capt. Richard Dow – bcdec – b. 1 Oct 1730 Salem, NH; d. 1798; m. Mary Saunders record not found and probably not in Salem. Richard and Mary had six children born between 1766 and 1783. After the war he settled in Bow, Merrimack NH near his brother Oliver. An abler man of business than his brothers he accumulated considerable property. iv. Asa Dow – bcded – b. 5 Apr 1743; Rockingham, New Hampshire; d. 1825 Windham, Rockingham, NH; m. 1769 to Mary Wheeler (b. 21 Sep 1750 in Salem, NH – d. ~1835) Mary’s parents were Benjamin Wheeler and Rebecca Pingue (Pengrye). Asa and Mary had thirteen children born between 1770 and 1792. Asa served in the Revolutionary War as a Sergeant. Asa was at the very outset of the war a sergeant in his father’s company and in the regiment of Colonel Nathan Hale (of Coventry, CT).. When the new Salem, NH company was organized in 1777 Asa continued as sergeant under his brother Capt. Richard and fought in this rank until the war ended. At its conclusion he returned to Salem, NH. In 1785 they bought the old Isaac Cochran farm in Windham and moved thither. Here Asa was at one time selectman. He died in 1825. Joanna’s husband Moses Tucker was born 28 Mar 1704 Salisbury, Mass. He was a pioneer of New Ipswich as early as 1747 and was its first selectman. Moses’ parents were Joseph Tucker and Phoebe Page of Kingston. He was a saddler in Kingston, NH . He served as captain in the French War. Moses died 6 Jan 1769 Sandown, Rockingham, NH. vi. Sarah Tucker – bcdff – b. 13 Mar 1739 New Ipswich, Hillsborough, NH; d. 1834 – Dublin, Cheshire, New Hampshire; m. 5 Jun 1755 – Temple, Hillsborough, New Hampshire to Ichabod Rowell (b. 2 Nov 1729 in Salisbury, Essex, Mass. 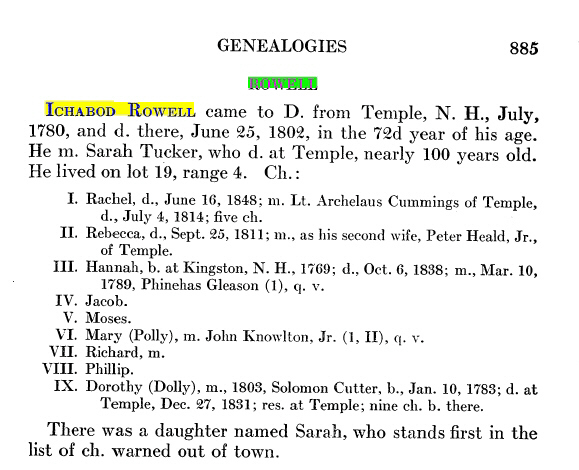 – d. 25 Jun 1802 in Dublin, Cheshire, New Hampshire) Ichabod’s parents were Philip Rowell and Sarah Davis. Sarah and Ichabod had nine children born between 1750 and 1783.
x. Joseph Tucker – bcdfj – b. 22 Oct 1748 Kingston, Rockingham, New Hampshire; d. 1791 ; m. 6 Jun 1775 – Reading, Middlesex, Mass. to Abigail Emerson (b. 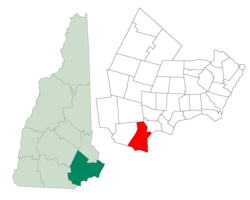 1756 in New Hampshire = d. 11 Feb 1795 in South Ipswich, New Hampshire) Abigail’s parents were James Emerson (1720 – 1808) and Mary Farrar (1725 – 1785). Lysander is now a northwest suburb of Syracuse. The town was part of the former Central New York Military Tract. It was first settled by outsiders around 1797.The Town of Lysander was formed in 1794 from the northern townships of the Military Tract. Lysander was later reduced by the creation of the Towns of Hannibal (1806) and Cicero (1807). Lysander was reduced again on the formation of Oswego County in 1816. I’ve always wondered why there were so many classical names in Central New York. Here’s why. The Military Tract of Central New York, also called the New Military Tract, consisted of nearly two million acres of bounty land set aside to compensate New York’s soldiers after their participation in the Revolutionary War. Each of the townships was to comprise 100 lots of 600 acres each. Three more such townships were later added to accommodate additional claims at the end of the war. Townships were as far as geographically feasible made up of a 10×10 square of mile-square (640 acre) lots; 40 acre were used for boundary roads, leaving 600 acres to be deeded in each lot. 94 lots in each Township were to be deeded, with the other 6 reserved for public purposes such as churches and schools. Jonathan’s wife Mary Haseltine was born 16 Feb 1723/24. Her parents were Jonathan Haseltine Jr and Mary Simons. Mary died in 1759. Jonathan was a yeoman of Plaistow. Plaistow records of his death gives 1769, a copyist error for 1759. Jonathan deeded land 12 Apr 1759, administration papers granted 25 Dec 1759, to Samuel Kimball of Plaistow, a kinsman who was appointed guardian of his children. Widow Mary received her thirds 22 Jan 1762. Plaistow records give all the children of Jonathan and Mary. There is no proof regarding the lives of the four half orphaned children of Jonathan. No marriages of the two girls are found in the well kept Haverhill records. iii. Nathan Dow – bcdhc – b. 20 Oct 1751 Plaistow, Rockingham, NH – Some Nathan Dow enlisted at Woburn in the 7th company, Col Thomas Nixon, receipted for pay 14 Feb 1777 to 4 May 1778 and was in service 3 Mar 1779. Some Nathan Dow enlisted at Danvers age 28, 5 feet 8 ruddy and receipted for pay 9 Jul 1780 to 6 Jan 1781. Nathan Dow enlisted at Danvers, but was 4 years younger. This might be a minor error. No dates conflict and the three may be identical. The pension list shows a Nathan Dow of NH in 1820, no particulars, NH vital statistics has a Nathan Dow of Hebron with wife Susanna, also two children. As Nathan was over 50 at this time, there might have been older children and Susanna might be a second wife. iv. William Dow – bcdhd – b. 18 Feb 1755 Plaistow, Rockingham, NH – No room for doubt of the identity of the William Dow, pioneer of Majorfield [Maugerville] NB, grantee of land 1793. William was a lumberman and was in business with his uncle David DOW and cousins Enoch DOW and Nith Dow The family narrative is clear that, after the disastrous freshet of 1802, William and his cousins Nith settled in Maine and may have posterity. Many disconnected Dow were in Maine from 1761 onward. Stephen’s wife Hannah Sheppard was born about 1723 in Amesbury, Essex, Mass. Her parents were Lieut. Samuel Sheppard and Judith Currier of Amesbury. Hannah died Died:after 1761 in Plaistow, Rockingham, NH. Presumably their whole lives were spent in Plaistow, but they get no mention except in birth records of their children. Stephen was a corporal under Captain John Hazzens, was at Crown Point 1758 in same company as brothers Nathaniel and Richard. ii. Ruth Dow – bcdib – b. 8 Jan 1747; bapt. 11 Jan 1746/47 Plaistow, Rockingham, NH; d. 16 Jul 1786 in Windham, Rockingham, New Hampshire; m. 7 Jun 1768 Windham to William Simpson (b. 22 Mar 1745; bapt. 5 Feb 1748 in Windham, NH – d. 15 Oct 1830 in Windham, NH) William’s parents were Alexander Nutfield Simpson (1721 – 1788) and Janet “Jennat” Templetonn(1719 – 1787). Ruth and William had ten children born between 1769 and 1786. After Ruth died, William married Mrs. Grissal Wilson (1750 – 1810) and had four more children between 1787 and 1792. Lots of mouths to feed! Sep 20 1776 – William Simpson was in Capt. Nathan Sanborn’s company, Col. Thomas Tash‘s Regiment raised to reinforce the Continental Army at New York. viii. Daniel Dow – bcdih – bapt. 26 Feb 1758 Plaistow, Rockingham, NH; unmentioned surely not in Revolutionary rolls or 1790 census. This entry was posted in -9th Generation, Line - Miller, Veteran and tagged Apr 19 1775 - Minuteman, Battle of Bennington, Battle of Lexington and Concord, Fort Crown Point, Haverhill, Haverhill Attacks. Bookmark the permalink. Our family branches off at Stephen II’s children. We descend from Richard Dow.